Ned Reade exhibit is Nature: Tamed and Untamed. In the first room of the Old Sculpin Gallery, Ned Reade explored the intersection of wild and subdued nature in his watercolors. From cut flowers contained in cans in the back of a blue truck to neat rows of landscaped bushes to wild roses spilling over a stone wall and a windswept landscape tempting a storm, Mr. Reade’s Nature: Tamed and Untamed examined the natural world and the way we have harnessed it. In a painting of a flower patch, daisies exist in the white space left behind strokes of lush green grass. Their centers are a yolky-gold, petals loosely defined by indigo shadows. Mr. Reade said he usually paints on location. A thermos of coffee, brushes, paint and papers are all he needs for a few hours of work. 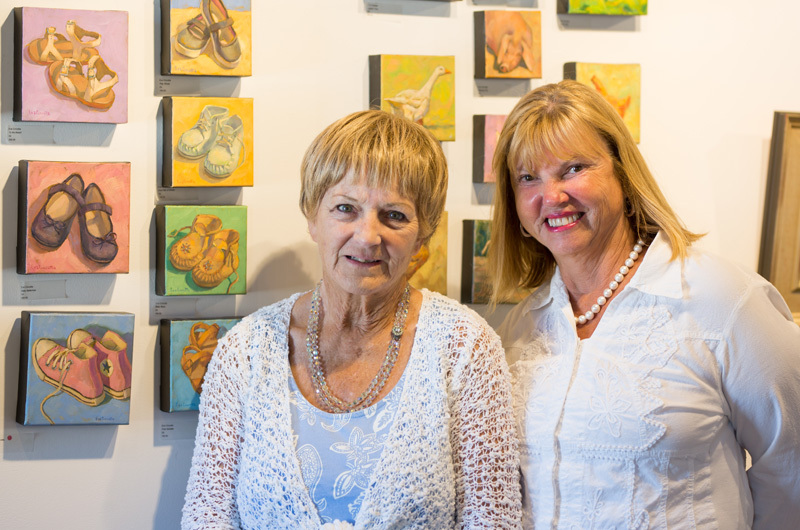 “I go out and paint like a golfer golfs on vacation,” the artist said. That is to say regularly and rigorously. 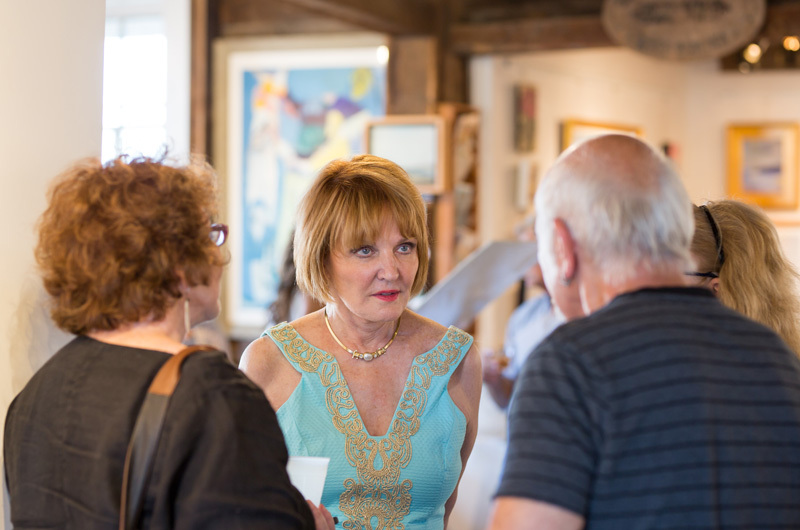 Mr. Reade looked over to another artist, who was also showing, Rosalie Ripaldi Shane. “We’ve been doing shows together for something like 25 years, we weren’t able to count them,” he said. 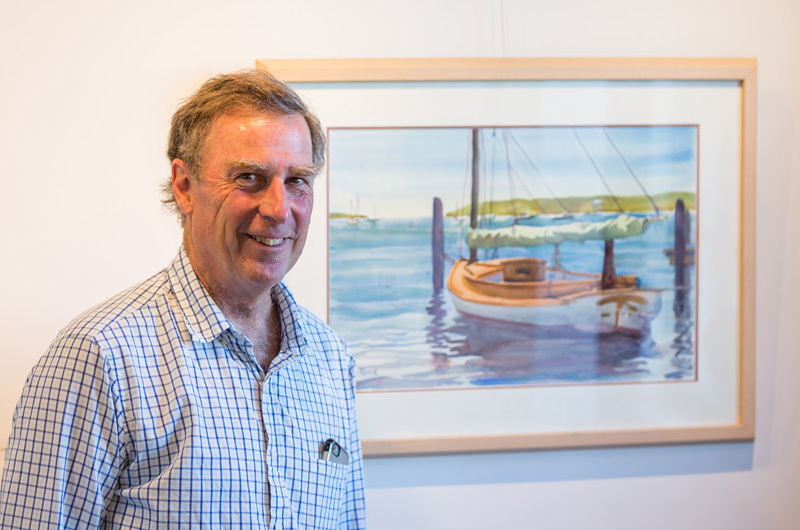 The Old Sculpin Gallery shows work by members of the Martha’s Vineyard Art Association every week, with openings on Sundays. 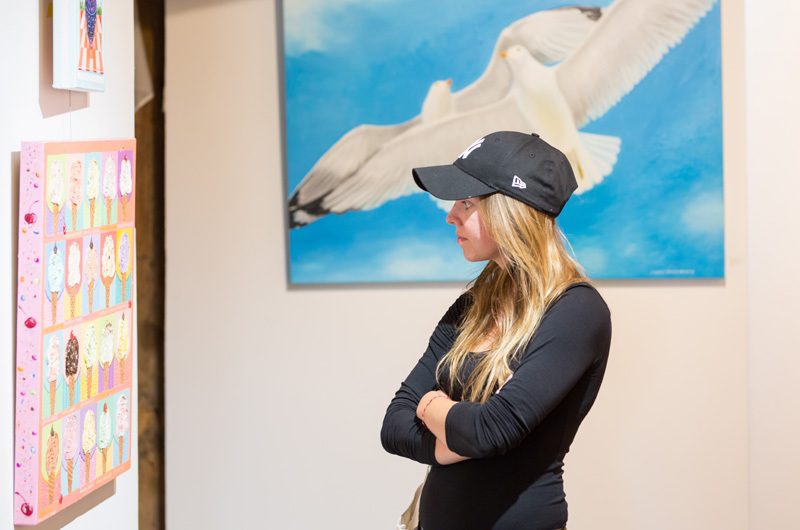 This week, four artists, Mr. Reade, Ms. Shane, Eva Cincotta and Janis Langley shared space, the art moving from watercolor to oils to pastels, always with a nod to the Island. Ms. Shane paints highly textured, brightly-colored paintings using a mixture of brushes and palette knives. Her use of texture came about because of a cupcake she painted for her granddaughter’s first birthday. 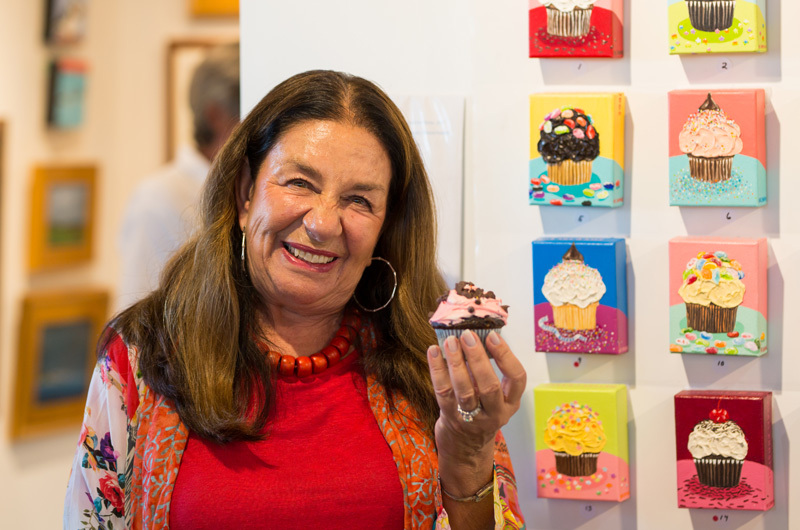 The paintings have titles like Chocolate Fudge, Jelly Beans on Pink and Green or Sprinkles. On a table nearby real cupcakes, baked for the opening, matched the paintings. Meanwhile, Eva Cincotta’s oils range from structured portraits of pairs of shoes to loose impressionistic landscapes preoccupied by sky. There are fiery marshes, a lone yellow boat pulled above the tide line, hash-marked ponds and dunes and cliffs. A painting of the Strand, stark on an empty street, sold to a couple who chatted with Ms. Cincotta. “It’s lonely, but it’s friendly,” she said of the painting. Along with the landscapes and shoes, small portraits of farm animals in varying degrees of impressionism peck and graze on painted canvases. Janis Langley a pastel artist, showed a selection of Island-themed paintings from a stacked trio of Vineyard lighthouses to irises from her own garden and a fall scene from around the corner of her Lagoon Pond home. One piece was done for the image on the Wind Festival poster, four kites floating high in the sky before a Vineyard-shaped cloud. There were also a few portraits of oysters from her recent trip to France. Ms. Langley admitted her love of oysters and said there is something inherently artistic in an oyster on the halfshell. “To me, they have an abstract quality to them,” she said. Work by Ned Reade, Rosalie Ripaldi Shane, Eva Cincotta and Janis Langley will hang through August 11 at the Old Sculpin Gallery in Edgartown.